SANTIAGO, Chile (Reuters) - A massive magnitude-8.3 earthquake struck near Concepcion, Chile, early on Saturday, the U.S. Geological Survey reported, shaking buildings and causing blackouts in parts of the capital of Santiago. A tsunami warning was issued for Chile and Peru by the Pacific Tsunami Warning Center, and a tsunami watch was issued for Ecuador. 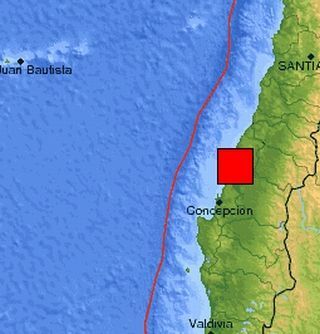 The earthquake struck 56 miles northeast of Concepcion at a depth of 34 miles at 3:34 a.m./1:34 EST. It's magnitude was reported at 8.3 and 8.5, then fixed by the USGS at 8.3. People streamed onto the streets of the Chilean capital, more than 200 miles north of the epicenter, hugging each other and crying, a Reuters witness reported. Buildings shook and there were blackouts in parts of the city. The Reuters witness reported very strong shaking lasting for 10 to 30 seconds. A national emergency official told local radio the government was evaluating damage in and around Concepcion. In 1960, Chile was hit by the world's biggest earthquake since records dating back to 1900, USGS data shows. The 9.5 magnitude quake devastated the south-central city of Valdivia, killing 1,655 people and sending a tsunami which battered Easter Island 2,300 miles off Chile's Pacific seaboard and continued as far as Hawaii, Japan and the Philippines.